"I'm, uh... my name is Agmaer, sir." 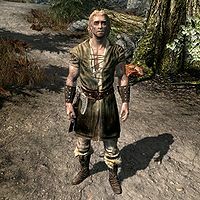 Agmaer is a Nord bandit initially found in Dayspring Canyon on his way to join the Dawnguard. He wants to become a vampire hunter but is too nervous to enter Fort Dawnguard alone and will instead accompany you to see Isran. He will move on to become one the first recruits of the Dawnguard and will, after completing the quest Prophet, be available as a follower. 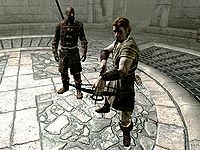 Before becoming a member of the Dawnguard, Agmaer wears a set of farm clothes with a pair of hide bracers and a pair of hide boots. He carries random leveled bandit loot and a torch, and also has a 25% chance of carrying 1-9 gold. He is equipped with an iron war axe which he refers to as his Pa's axe. As you enter Dayspring Canyon, you will find the young farmer standing near the central lake, obviously undecided on whether to see Isran or not. When he notices you he will say: "Oh, hey there! You here to join the Dawnguard, too?" He will then admit: "Truth is, I'm a little nervous. I've never done anything like this before. I hope you don't mind if I walk up with you." While running towards the fort he will make a small request: "Hey, uh, don't tell Isran I was afraid to meet him by myself. Not the best first impression for a new vampire hunter, I guess." He will also explain: "I heard what's going on. The vampires, the Dawnguard, all of it. I wanted to help, so here I am." He will also reckon: "You've probably killed lots of vampires, huh? I'm sure Isran will sign you right up. Not sure he'll take me. I hope so." When he arrives at the foot of the fort, he will stop and admire the view: "That must be it. Fort Dawnguard... Wow. Bigger than I expected." He will then proceed towards the entrance but will wonder: "Where is everybody? This place looks almost deserted." Just before reaching the entrance he will say: "I guess this is it. Wish me luck." and run past the guard Celann. Isran: "You there, boy. Stop skulking in the shadows and step up here. What's your name?" Agmaer: "I'm, uh... my name is Agmaer, sir." Isran: "Do I look like a 'sir' to you, boy? I'm not a soldier, and you're not joining the army." Isran: "Didn't I tell you to step forward? Hmm... Farm boy, eh? What's your weapon?" Agmaer: "Uh, my weapon? I mostly just use my pa's axe, when wolves are attacking the goats or something." Isran: "'My pa's axe', Stendarr preserve us. Don't worry, I think we can make a Dawnguard out of you. Here, take this crossbow and let's see how you shoot." Agmaer: "Uh, crossbow? I've never..."
Isran: "Yes, a crossbow. Best thing for killing vampires. Just take a few shots at those crates over there." A crossbow will then be added to Agmaer's inventory and he will start practicing his aim on the crates near the northern hallway. Isran will stand by his side, randomly commenting on each shot: "You need to concentrate, boy. Try it again. ", "Take a deep breath and let it out as you fire. ", "You'll get the hang of it. ", "Watch the recoil. Takes some getting used to." and "That's it." 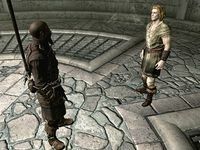 When speaking with Agmaer at this point, he will explain why he wants to join the Dawnguard: "I've heard the rumors around Skyrim. I know something's going on. And I've seen the vampires. I felt I had two choices. I could either live in fear of the night, or I could help do something to help protect my people." When exiting conversation he will say: "Keep your neck covered!" Later, when you return from Dimhollow Crypt, Agmaer will be a full-fledged member of the Dawnguard and don the clothes to match the position, including brown Dawnguard heavy armor with Dawnguard boots and Dawnguard gauntlets. He will also have a new routine in Fort Dawnguard. He owns one of the cots in the northern section on the ground floor and sleeps there between 8pm and 4am. After he wakes up he walks over to the western dining area where he hangs out all day long, eating, relaxing, or wandering around. After the quest Prophet, Agmaer will be available as a follower. When it is time to confront Lord Harkon during the quest Kindred Judgement, Agmaer will listen to Isran's speech in the main hall along with the other Dawnguard members. When Isran gives the order, he will travel halfway across Skyrim to Castle Volkihar and will participate in the joint effort to kill all residing vampires, while shouting: "Victory to the Dawnguard!" When all is said and done, he will sheathe his weapon and walk all the way back to Fort Dawnguard and live there indefinitely with the other members. When Agmaer shoots the steel bolts at the targets during his initial training, they never disappear. Agmaer will continue to shoot bolts until you return from any Dawnguard quest. This is a good way to get a lot of steel bolts early. If the Dragonborn add-on is installed, when asking him to follow you he may have the same dialogue option as Talvas Fathryon. If you have killed Durak before entering Dayspring Canyon, when you first meet Agmaer, he will be hostile to you. ? Esta página foi modificada pela última vez à(s) 04h27min de 21 de março de 2015.